I'm always on the lookout for photo and illustration sources for work or personal use. When I saw this wall art idea in the April issue of Martha Stewart Living, I followed the source of the balloon illustrations back to the Library of Congress's prints and photographs catalog. It's a gallery of digitized images you can download and print, sorted by collection. All the images I looked at had "no known restrictions on publication," and in most cases, you can grab high res files ranging from 3"x5" to 11"x16" at 300 dpi. The hot air balloons on the clipboards are from this collection. I also loved the WPA poster collection. Enjoy! Thank you for sharing this resource. WOW! THANK YOU for posting this! I have been wanting to put the national park posters in my kids rooms but dragging my feet over paying $30+ each...now I can print my own...thank you thank you! Abby, great! Of course, they can't be blown up infinitely huge, so depending on the file size you're starting with, you might not be able to achieve poster size. But do some experimenting. Thank you!! I live in Long Beach and the Chocolate Soldier poster is great. Thanks so much for this info!! I'm headed over to check them out now - Wouldn't have ever thought to check the Library of Congress for images! Such a great idea. I also recently learned that you can print out images of patented objects. Some of the blueprints and early sketches look great when framed! Oh my gosh! Thank you so much for sharing this. I see myself spending lots of time digging through those images. I *love* vintage poster design. Thank you so much for this post. I had no idea that so many WPA images are available - they are my favorites! Wonderful resource. Thank you, Jessica, for sharing it. I saw this in MS also a few days ago and meant to check out the L of C collection online, but forgot. As usual, I can depend on you to be on the ball with just the kind of graphic design tips and trends I love. Just a note in the midst of all the Google Reader furor . . . about five years ago I found your blog when discovering the online craft world. I went into overdrive, following so many blogs in Reader that I could never keep up with the content. I've carefully culled my reader feed into a very select collection of favorites that never disappoint . . . your wonderful blog, of course, made the cut. Thanks for what you do and for all the goodies you share with so many. Oh, and please design more fabric! THANK YOU for sharing the link! WOW, super-great archive!! Really great... thanks for sharing this. My head is spinning with the possibilities! Oh holy cow, this is amazing. Thank you so much for pointing out this resource. Husband and I have been debating about what to use as decoration on a big wall in our kitchen, and I'm pretty sure that we'll be able to agree on something awesome in this catalog. Thank you! Thanks for these links...how neat! I really like some of the old photos on the site. That is quite fun to look through all of those images. I noticed in the WPA posters there were several "find syphilis" posters. Made me laugh a bit. Ha! Can't say I've seen a poster like that recently. Thank goodness. Oh I will enjoy! Thank you! Anon, terrific! Thanks for giving us all that notice. I know everyone wants to do the right thing, and there seems to be a lot of confusion about vintage images. I'm so excited to have another source of public domain images for my crafting and collaging! yaay! 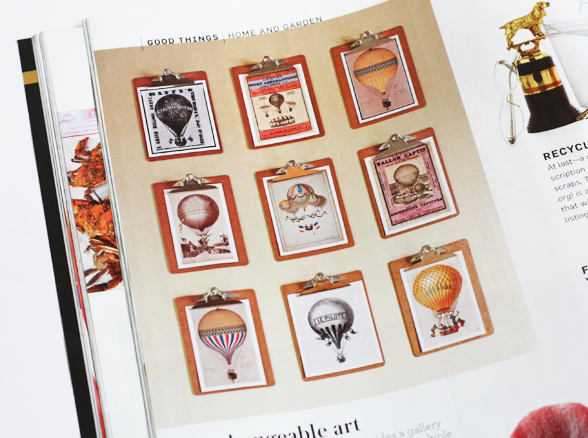 And those hot air balloons are so cute - I don't read Martha Stewart Living so I'm really glad you put them up :) Thanks! Thank you so much for sharing this, I cannot wait to check this out and see what fun project I can come up with. Fantastic! So very cool. Thanks for sharing! Fantastic! So cool. Thanks for sharing! Fantastic! So cool! Thanks for sharing. Thanks for sharing this; I had the best time checking out the posters, esp. the NY ones from the 30s. Really neat. OMG. I so love you for posting that. They will look amazing all printed and framed. Thanks for sharing! u r so great!